In a city so steeped in history and tradition there’s plenty to explore and take in on any budget. While New Orleans is not lacking in high-end restaurants and upscale entertainment, some of the best things the city has to offer are free and available anytime. There are plenty of public spaces and inexpensive restaurants with excellent food, some museums are free or have a nominal admission fee, and the newly improved public transportation is one of the best ways to get around. Plus, summer is a good time to get deals and discounts on meals and museum admissions. Here’s how you can explore the French Quarter on a quarter and still get the best of sightseeing, with plenty of great food, drink, and entertainment. What could be better than a stroll and a picnic by the riverfront? Bring a po-boy or a muffuletta and set up a picnic on one of the many benches or grassy spots spread out along the river at Woldenberg Park. Catch some street performances along the Moonwalk and check out some great public art. You can watch the boats go by, including the picturesque riverboats. Steamboat Natchez, a classic southern riverboat straight out of a Mark Twain novel, sails three times a day for cruises off the Toulouse St. Wharf (behind JAX Brewery). Approximately 30 minutes before departure, you can hear its Steam Calliope, a 32-note steam pipe organ, being played. It’s hard to miss, even if you’re not that close to the wharf, and it’s one of the unmistakably unique sounds of New Orleans. Another great spot for a stroll and a picnic is the tranquil Louis Armstrong Park, located just across N. Rampart Street that marks the edge of the French Quarter and the beginning of Treme. Unless there’s a festival or another special event held on the grounds, this 32-acre expanse of green space won’t be crowded. It’s perfect for spotting turtles in the water and bird-watching. Don’t forget to visit the historic Congo Square located inside the park! It’s not hard to find reasonably priced food in the French Quarter, but a few institutions stand out. Of course, if you can swing it, the quintessential fine dining should be part of your experience. 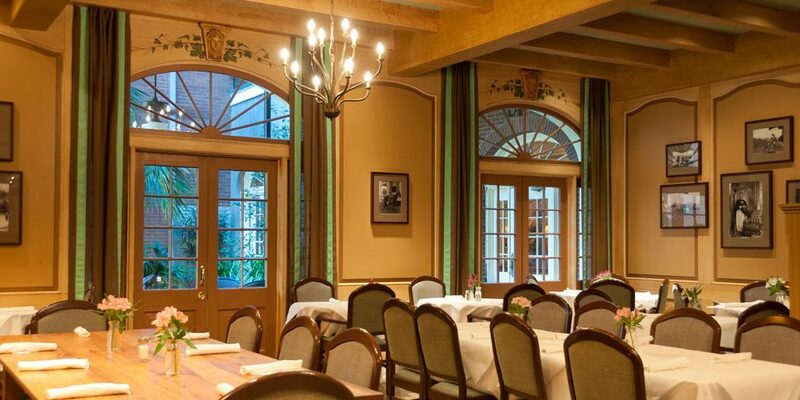 After all, places like Galatoire’s and Antoine’s are considered iconic for very good reasons. However, if you want a quick, inexpensive meal any time of day or night, with some local color thrown in, these five spots are unbeatable: Coop’s Place, Verti Marte, Quartermaster Deli, Killer Poboys, and Central Grocery. Coop’s Place on an always-busy stretch of Decatur Street is a no-frills bar-and-restaurant with a surprisingly extensive and excellent menu that goes way beyond the barfood grub of fries and onion rings. Try the crab claws (fried or marinated), shrimp remoulade, or the very good smoked duck quesadilla. The hands-down standouts are the seafood gumbo and rabbit and sausage jambalaya (the “supreme” version also has shrimp and tasso). All sandwiches come with either a bun or French bread, and the Cajun fried chicken plate comes in a variety of pieces, served with jambalaya and coleslaw. Coop’s is popular with the locals and the tourists, so it can get busy and loud. Please also note that it’s 21 and older only, even the restaurant seating area, because of the video poker machines on premises. The tiny, beloved Verti Marte on Royal Street is open 24/7 for takeout or delivery (cash only). You can order from a long menu of sandwiches, sides and entrees at the back counter. Verti Marte’s po-boys are legendary, as is its breakfast items and a long list of salads. Try the Cuban sandwich, the Philly cheese steak on a bun or French, or the beef brisket. The epic specialty sandwiches include the vegetarian Green Giant and the mountainous All That Jazz — with grilled ham, turkey and shrimp, plus two cheeses, grilled veggies, and the special “wow” sauce. Another takeout/delivery 24-hour institution is the Quarter Master Deli, also known the Nellie Deli. The store offers free delivery not only on the food but on all of its grocery items, liquor and cigarettes. Quarter Master’s menu is full of burgers, overstuffed po-boys, house-made salads, and other New Orleans-style Southern fare like BBQ chicken and ribs. There’s a hearty breakfast menu and daily specials like New Orleans meatloaf. The late-night menu (11 p.m. – 6 a.m.) covers the basics with jalapeno poppers, wings, chicken tenders, and other fried favorites. Killer Poboys lives up to its name with now two locations: the original takeout-only inside Erin Rose, a popular Irish pub on Conti Street, and a sit-down at 219 Dauphine Street. The Erin Rose to-go menu keeps it simple with four po-boys and a grilled cheese sandwich, all under $14 (try the Dark and Stormy pork belly or seared shrimp, with touches like rum ginger glaze and garlic aioli). The Dauphine St. location has the same low prices for its expanded offerings like chorizo, cheddar omelet, and smoked salmon po-boys, with sides and alcoholic beverages. Central Grocery, a sprawling old-fashioned grocery store on a buzzing block of Decatur Street, is not called “Home of the Original Muffuletta” for nothing. Its founder, a Sicilian immigrant named Salvatore Lupo, is credited for creating the famous sandwich. The store is still lovingly run by the same family, and is packed full of imported Italian delicacies, including the famous olive salad by the jar. Central Grocery is worth a look for that reason alone, but it’s the made-to-order muffulettas that have the visitors and the locals flocking there since 1906. You can eat in at one of the few tables in the back, or take your muffuletta to go. The visitors of the city have been known to pack them for a flight or a drive home, so it’s probably good news that Central Grocery now ships nationwide. The Historic New Orleans Collection (THNOC) is a museum and public research center spread over two campuses in 10 historic buildings in the French Quarter. It’s free to the public (except for the guided tours). The Royal Street campus (533 Royal St.) houses the main museum with a permanent exhibit on state history, plus rotating exhibits on history and art. The two current exhibits, featuring jazz posters and the history of Storyville, run through December. 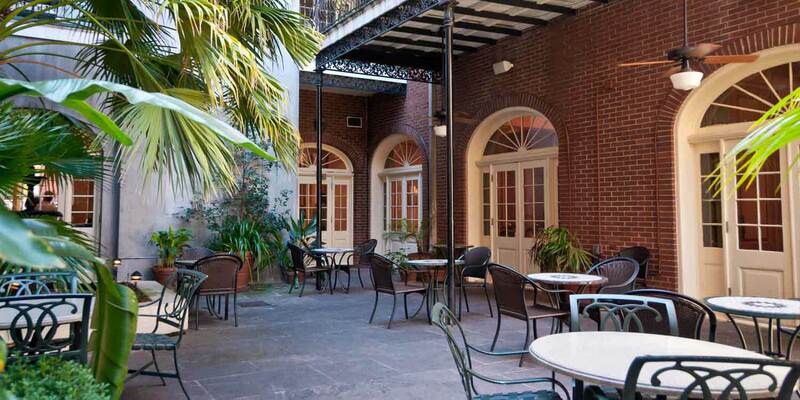 The free self-guided tours of historic buildings and courtyards cover several locations in the French Quarter. Find the details on how you can use your mobile phone to navigate the narrated tour, or to download the app, here. The Old U.S. Mint is part of the Louisiana State Museum and is also free to the public. The 1835 building now houses a permanent collection of coins and stamping presses. The “New Orleans Jazz” exhibit upstairs features priceless pieces like Louis Armstrong’s first cornet and Fats Domino’s Steinway grand piano, historic recordings, and rare film footage. Also part of the Louisiana State Museum, Madame John’s Legacy Creole house at 632 Dumaine Street is considered one of the best examples of French colonial architecture in North America. It was built in 1788 and survived the great fire of 1794. The compound consists of the main house, the kitchen with cook’s quarters and the two-story garconniere (gentlemen’s guest quarters). The main house is the only building open to the public and now houses a ceramics exhibit. The house was famously mentioned by Lafcadio Hearn, and you may recognize it in both Interview with the Vampire and 12 Years a Slave. Hop On Hop Off bus tours by City Sightseeing are a great way to cover large swaths of the Quarter, Garden District and CBD in a matter of hours. These open-top double-decker buses run every 30 minutes on a two-hour loop, and you can get off at any designated stop and then get back on a different bus anytime. The unlimited one-day pass is $39 for adults and $10 for kids under 12. The best deal is unlimited three-day pass for $49, because it includes two guided walking tours of the French Quarter and the Garden District. A visitor favorite, the St. Charles streetcar line, will take you through the Garden District for $1.25 one way. The Canal Street/City Park/Museum line goes all the way to City Park and the New Orleans Museum of Art; the Riverfront line will take you to Harrah’s and the river; and the Canal Street/Cemeteries line has its last stop at a prodigious cluster of cemeteries in Mid-City. The recently added Rampart/St. Claude line will get you to the stretch of art galleries, bars, and eateries on St. Claude. If you’re planning to use multiple lines or hop on and off, consider a one-day bus and streetcar pass ($3). For a longer visit, get a 31-day pass for $105 that also includes the ferry. RTA’s GoMobile app lets you purchase and use passes using your smartphone. Exploring the French Quarter on foot is rewarding and easy — it’s flat and not that big. There is always Bourbon Street, 13 blocks of it from Canal Street down to Esplanade Avenue, with its party ambiance and clusters of bars and restaurants. 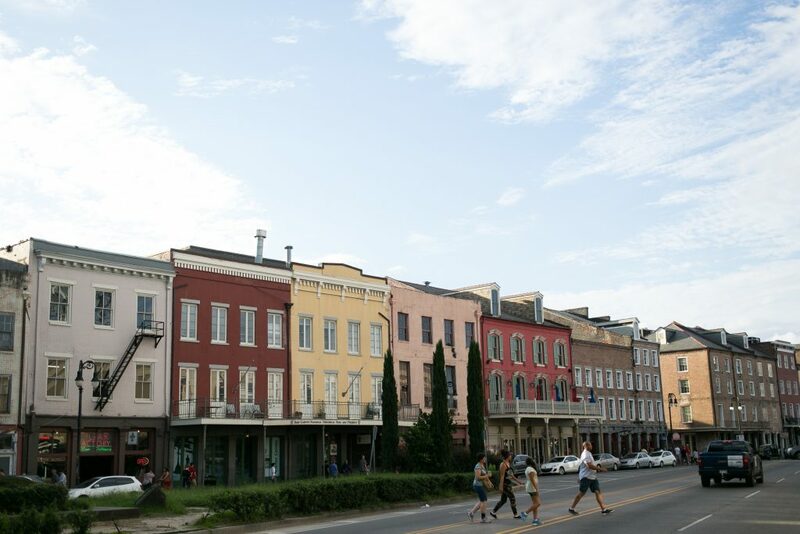 For a different scene, try the picturesque Royal Street that runs parallel to Bourbon. The scenic stretch between St. Louis and St. Ann streets is a pedestrian mall closed to traffic from 11 a.m. to 4 p.m. daily. You’ll enjoy a mix of performance art, live music on the corners, eclectic art galleries, funky boutiques, and upscale antique shops that are considered some of the best in the world. Excellent for people-watching and window shopping, Royal Street is also known for its abundance of historic architectural details, plus lush tropical courtyards. Admire the wrought iron fence of the Cornstalk Hotel, have a cochon de lait sandwich in Amelie’s courtyard, and check out the famous Blue Dog paintings at George Rodrique Studios. Jackson Square is another must for free live music; its open-air artist market makes for a colorful and lively scene in general, complete with tarot card readers and an eclectic crowd. Check out the bronze statue of Andrew Jackson facing the western Pontalba Apartments with a gurgling fountain nearby, as well as art displayed along the fence. Across the park mule-drawn carriage rides are offered to the passerby. In front of the St. Louis Cathedral you’ll often find a brass band entertaining the crowd for tips. Explore the Cathedral’s stunning interior during its hours of operation, or attend a mass or a free music concert. Depending on time of day, you may get to hear its bell or witness an occasional wedding party spilling out to form a second line. Every summer the French Quarter Business Association offers discounts on food, beverages, tours, and shopping with its Passport to the French Quarter. Download yours for deals from dozens of French Quarter retailers, restaurants, bars, and cultural attractions. You can also access the current offerings of coupons from various local restaurants at NewOrleansRestaurants.com.